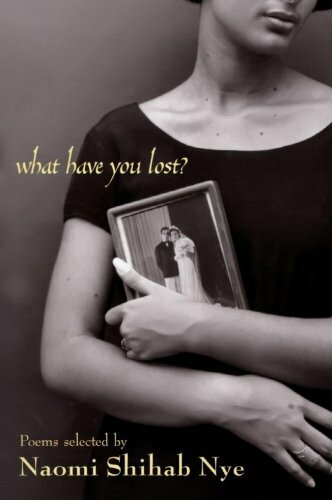 What Have You Lost? Some Poetry! A fascinating and diverse selection of poems centering on things lost and things found. Everything from family to self to race to culture to the first day of school to death to words to language to innocence.... So many of the poems inspired and helped me discern what I do and do not like in my own work. Many made me feel as if I were throwing my jell-o heart against a wall again and again. Excruciatingly moving, such as the line from “And Sometimes I hear this Song in My Head” by Harriet Jacobs: “Staring down the darkness some call our future.” I see the transcendence, the stubborn refusal to accept the fate prescribed by others. Feelings caught in words like meeting myself at the crossroads in “I Myself” by Angel Gonzalez, or “Hitchhiker” by Santiago Baca. “He is the pupil/who has stayed after school/the rest of his life,/to write loneliness and love/on the darkness,/with the chalky pumice of his heart.” I would not be able to list my favorites, there were too many. My only regret: that the book is so long, so full, because I can read only a few at a time before I’m overwhelmed. I would have preferred several volumes. Of course, then, I might not have had opportunity to read them all. Side note: I did not especially like the artwork in the book. The portraits felt redundant and, although some were poignant and provoking, many (to me anyway) had an air of mockery, a lack of respect for the subject. This, I thought, detracted from the poetry.